Liquid biopsy developer Angle said it has enrolled the first patient for its ANG-002 clinical study, designed to assess its Parsortix PC1 system in patients with metastatic breast cancer. The clinical study (NCT03427450) is intended to support FDA clearance of Parsortix PC1 as an in vitro diagnostic device. Angle says it is seeking to become the first company to receive FDA Class II clearance for a test designed to harvest intact circulating tumor cells (CTCs) from patient blood for subsequent analysis. “This would be a key step in establishing the Parsortix system as the system of choice for CTC liquid biopsy securing a leading position in the emerging multi-billion-dollar liquid biopsy market,” Angle founder and CEO Andrew Newland said in a statement. Parsortix uses a disposable microscope slide-sized cassette to capture and harvest CTCs from the blood samples of patients, based on the cells’ size and compressibility. 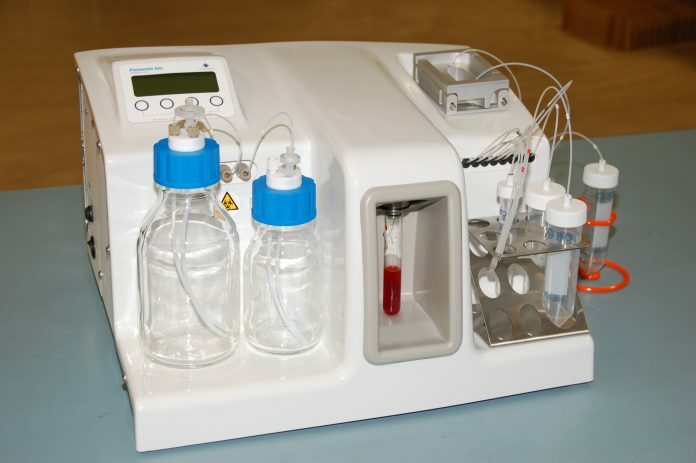 The platform uses a step-based reverse flow system that according to Angle allows the easy harvest of viable cells for analysis. Researchers from The University of Texas MD Anderson Cancer Center are leading the clinical study, which involves recruitment of 200 metastatic breast cancer patients and 200 healthy volunteers enrolled at leading US cancer centers. The study’s primary endpoint is the cytological evaluation of harvested cells confirming that CTCs are harvested from metastatic breast cancer patients but not from healthy volunteers, Angle said. In addition to demonstrating the efficacy of Parsortix, the study is also intended to show that the harvested CTCs can be used effectively for different types of evaluations. “The cells harvested from the remaining blood tube will be used for one of three different evaluations: Fluorescence in-situ hybridization (FISH) for evaluation of Her-2/neu gene amplification, quantitative reverse-transcriptase real-time PCR (qRT-PCR) for evaluation of cancer related gene expression, or whole transcriptome sequencing (RNAseq) for determination of the expression patterns of breast cancer related genes,” Angle states on the trial’s page at ClinicalTrials.gov, last updated on April 2. MD Anderson is overseeing qRT-PCR, while researchers from the University of Southern California will carry out FISH and RNAseq. Abbott has agreed to supply its proprietary PathVysion HER-2 DNA FISH Probe kits to Angle for the study. PathVysion was released in 1998 and three years later became the first gene-based test approved by the FDA for determining HER-2 status. Another collaboration partner of Angle is Qiagen, which in September 2017 selected Parsortix as its CTC harvesting technology, and agreed to cross-promote Parsortix with its liquid biopsy solution portfolio. “Once the rate of enrolment and general progress of the clinical study becomes clear we will update the market on likely timescales,” Angle stated. The company expects to complete both the clinical study and the associated analytical studies in the second half of this year. The global liquid biopsy market is expected to grow at a combined annual growth rate (CAGR) of 24.1% between 2017 and 2023, when it is projected to reach $11.7 billion, according to an Infoholic Research report released in December 2017. ResearchAndMarkets.com last month issued a more conservative forecast, predicting the market will grow to $8.73 billion by 2024. That report said that among cancer indications, breast cancer commanded the largest share of liquid biopsy tests in 2017—but that lung cancer is projected to grow at the highest CAGR from 2017-2024. To date, the FDA has cleared two liquid biopsy tests. The first approval came in 2008 when the agency cleared CellSearch, a platform that uses CTC counting to assess prognosis in metastatic breast, colorectal or prostate cancers. CellSearch was developed by Johnson & Johnson’s Veridex, later renamed Janssen Diagnostics—which sold CellSearch assets to Menarini-Silicon Biosystems for an undisclosed price, in a deal completed in April 2017. The FDA’s second clearance came in 2016, when the agency approved Roche’s cobas EGFR Mutation Test v2, which uses plasma specimens, as a companion diagnostic test for the detection of exon 19 deletions or exon 21 (L858R) substitution mutations in the epidermal growth factor recptor (EGFR) gene. The test is designed to identify patients with metastatic non-small cell lung cancer who are eligible for treatment with Tarceva (erlotinib).